Fender washers are similar in shape to a standard flat washer but they differ in that the outside diameter is traditionally much larger in proportion to the center hole. 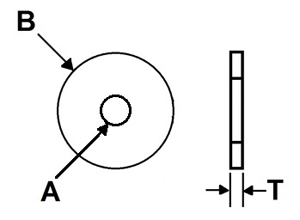 This design helps to distribute the forces applied when tightening the bolt. The oversized outside diameter also provides more bearing surface for the load of the fastener. Fender washers are commonly used in automotive, sheet metal, plumbing, and electrical applications. .051"-.080" 7/32" 3/16" 1 1/4"
.051"-.080" 7/32" 3/16" 1 1/2"
.051"-.080" 9/32" 1/4" 1 1/4"
.051"-.080" 9/32" 1/4" 1 1/2"
.051"-.080" 11/32" 5/16" 1 1/4"
.051"-.080" 11/32" 5/16" 1 1/2"
.051"-.080" 11/32" 5/16" 1 3/4"